Stained glass window rejuvenation is becoming increasingly critical as the world’s stained glass windows are rapidly maturing. For many years, these stained glass treasures have been exposed to the elements, causing deterioration and forcing the need for repair and restoration. A professional stained glass consultant is versed in all facets of repair and restoration, and they are able to act as an expert resource for your windows’ rejuvenation. 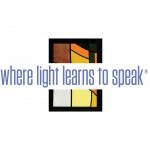 Associated Crafts® and Willet Hauser® are leaders in caring for the stained glass treasures of the United States. Read on for an overview of the various aspects of window repair and restoration. 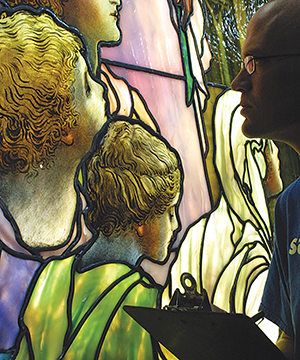 A detailed inspection with a qualified studio representative is the first step toward a stained glass window restoration. During the evaluation, various aspects of the window are closely examined — such as the structural support system, the lead came matrix, and vitreous paint condition, as well as the presence of previous poor repairs. The frame and protective glazing system are also examined as they are a crucial aspect of the stained glass window envelope. Photographs are taken to aid both the studio representative and the restoration team to develop an accurate Condition Report. The report includes, but is not limited to, a comprehensive explanation of the problems and the prescribed services to remedy them. Repair: We generally refer to issues that do not require full restoration as repair. These items include replacement of broken glass, rescuing loose braces, cleaning and much more. These services are generally performed onsite, but some services require the removal of sections for repair. It is very important to have a studio that has trained staff to perform this type of repair. Often, stained glass studios are not experienced in all areas of repair or restoration and tend to sway the client to order services that fit their business model instead of what the client really needs. Historic Restoration: This generally refers to the performance of releading. The windows are carefully removed from their framing, crated, and transported to the studio for restoration. After the necessary documentation is taken — such as photographs, archival rubbings and measurements — panels are disassembled, and the fatigued lead is removed and recycled. Each piece of glass is carefully cleaned and repaired, if necessary; the degree of cleaning and techniques chosen are dependent upon the stability of the surface decoration. With a Historic Restoration, the policy is to retain as much of the original glass fabric as possible in order to preserve the intended visual and aesthetic artistry in the least intrusive and reversible way. Frames are the structure that support and house the stained glass panels. 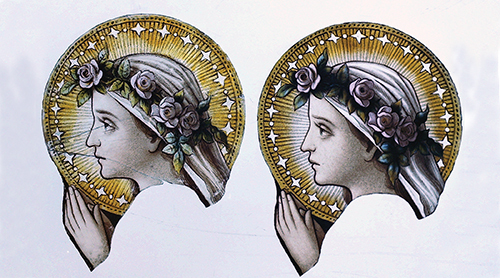 Over the years, frames — like stained glass — suffer deterioration and need to be addressed. It is very important that these frames are repaired or replaced as required. Frame maintenance (often referring to scraping and painting) is crucial to their longevity. 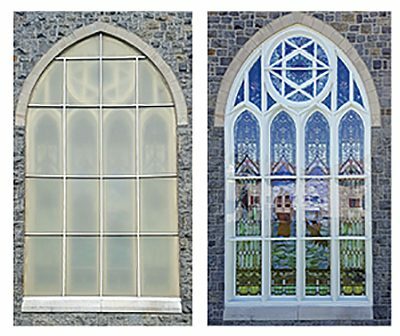 Be sure your prospective stained glass company has experienced steelworkers and woodworkers on staff to ensure that the most important part of your window — the structural system — is addressed correctly. Too often, companies simply do not have the staff or experience to properly address the structural system, leaving the client to suffer issues in the future. Protective glazing is another integral part of a window’s longevity. Though an effective way to insulate and protect valuable works of art, protective glazing is often installed improperly, creating less-than-desired long-term effects. Therefore, we recommend the Klear-Flo® glazing system for high-quality work and proven protection. Learn more about protective glazing in issues to come. Church committee members are charged with the stewardship of valuable material assets of the church building. Unfortunately, few have experience with this type of work. Committee members must do their homework to make the best selections for their church. In order to do this, I urge you to download our stained glass project guide at www.willethauser.com. John Phillips is Founder & CEO of Associated Crafts® & Willet Hauser Architectural Glass® — the largest studio in North America — headquartered in Winona, MN. 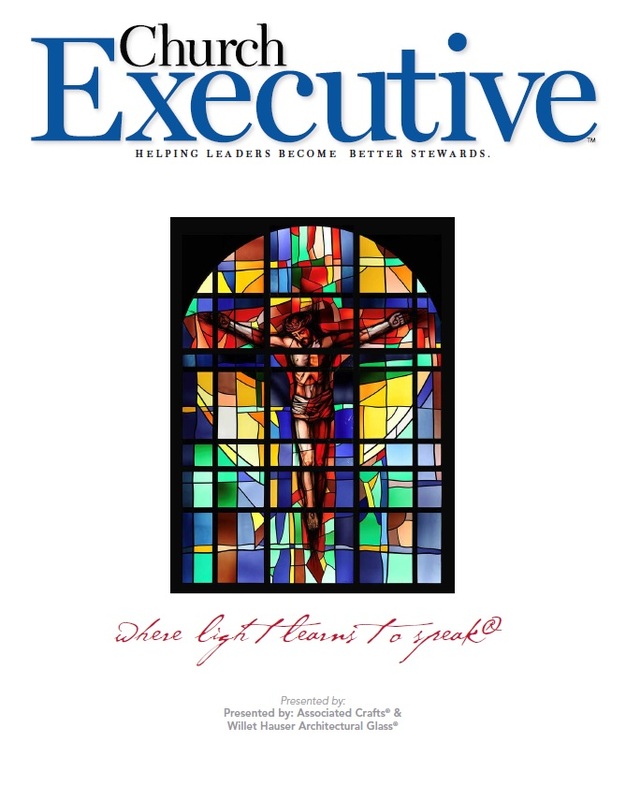 The firm has served more than 20,000 churches and institutions in the last century. For more information, visit willethauser.com or call (800) 533-3960.